With this tip, you need to ensure you bring as much light as possible to the bathroom. It’s been proven that bright and light rooms often look and feel more spacious compared to drab and dark ones. The walls and the ceiling should be painted with the same light colour. For any windows, ensure you use coverings that maximize the natural light. Additional flush-mount ceiling or wall lights also increase the light in the room. Add larger and more mirrors that would be required for an average bathroom. This will reflect light, thereby opening the small bathroom space into a space that feels and appears more spacious. Clutter is the master of crowding space. They can really clutter your bathroom quicker than you think. The rule to use should be that anything that you won’t need in the bathroom should be eliminated and stored elsewhere. Everything that you should leave in the bathroom should only be what’s absolutely necessary for there. A bathmat that’s always lying on the floor can cause the bathroom to look and feel very small. Whenever you’re not using the bathmats, ensure they’re put away. This way, more of the floor will be left exposed. This makes the space on the floor to appear larger than it actually is. All the storage should be kept as flush with the bathroom walls as possible. The reason for this is that anything sticking out in the room will close the space in by chopping it up. Instead of the normal cabinets, go for medicine cabinets and recessed shelving. Shower curtain bars that are raised all the way to the bathroom ceiling ensure that eyes are drawn up. This also makes the ceiling seem to be taller thereby creating an illusion of a larger space. Depending on how small the space in your bathroom is, a swinging door can take up to around half the space. Therefore, by installing a wall-pocket door or a barn door, you’re ensuring that no space in the bathroom is taken up unnecessarily. Shower doors made of clear glass make the room to appear bigger. The frame around the glass also has an effect of causing the bathroom to appear even smaller. Therefore, by installing glass shower doors that are frameless, you’ll be able to make the space smooth and more open. A darker floor will negate all the effects brought about by bright ceilings and walls. To create a space with an open flow and bright, you should keep the flooring bright. 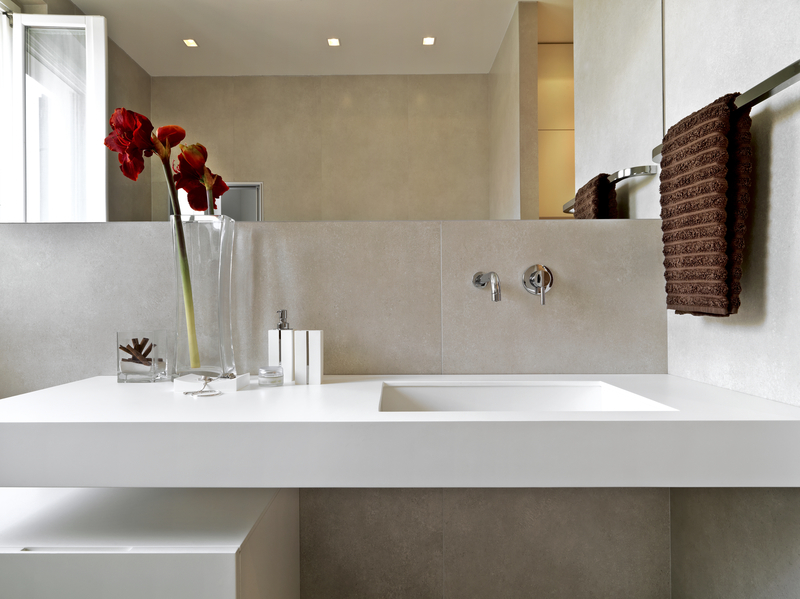 Vanity has the effect of taking up space in bathrooms that are very valuable. Instead, try out the pedestal sink. With these 10 tips, you’ll be able to make your small bathroom space look and feel bigger than it really is. For more information, please visit Top Bathrooms website.